Greetings! It’s so great to be with you today. As a military spouse who frequently moves, I’ve become very familiar with turning a temporary space into an enjoyable and functional home quickly. There are so many similar eyesores renters face and I’m sharing creative solutions today for turning those uglies into something pretty! Inconvenient placement of something odd. It cracks me up when I see something like a phone (this one is actually the speaker to our doorbell and callbox) in the middle of a living room wall. Two feet to the right it could be hidden by the kitchen wall. Seriously. Unfortunately, it is something that needs to stay. So if you can’t remove it, cover it! 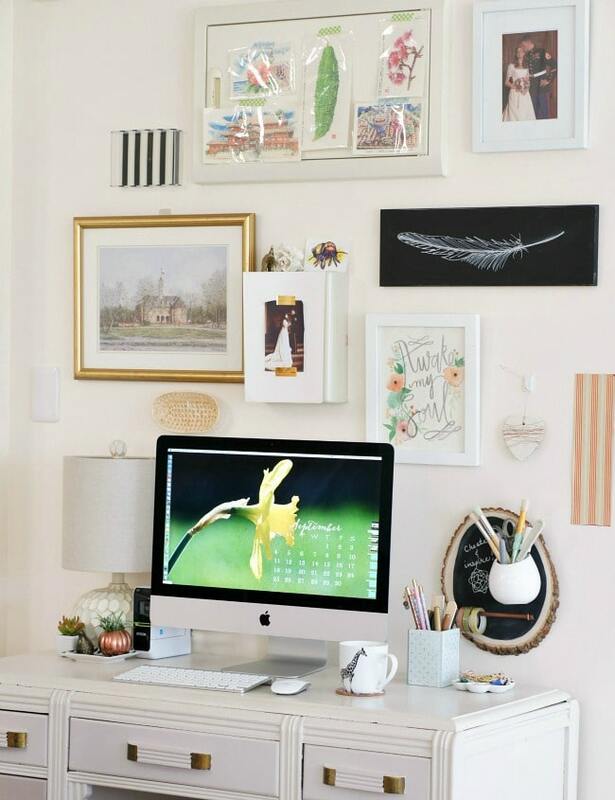 Since the object makes it impossible to hang something over it, leaning art is the perfect solution. Exposed cable and electrical outlets. Renters have to make their furniture work in many spaces with different furniture arrangements. 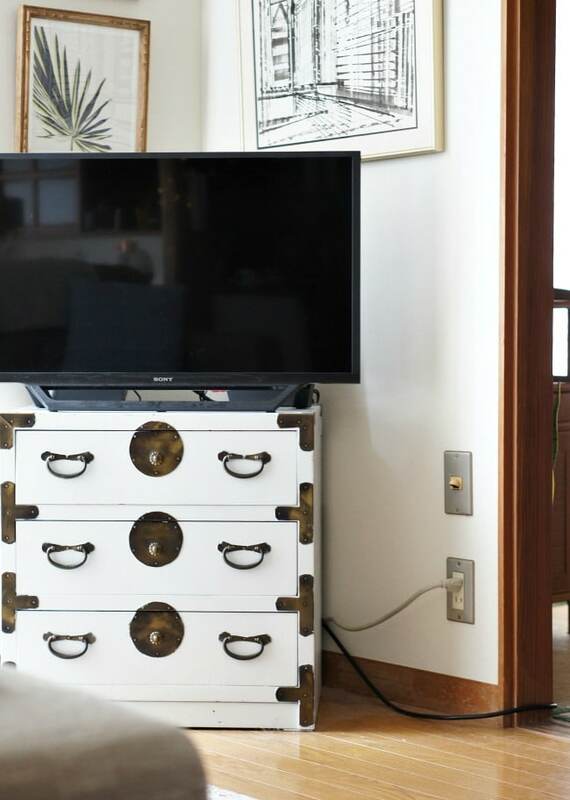 It’s a common problem to not be able to cover all the outlets for your media needs. (It’s sure nice when it does work out!) 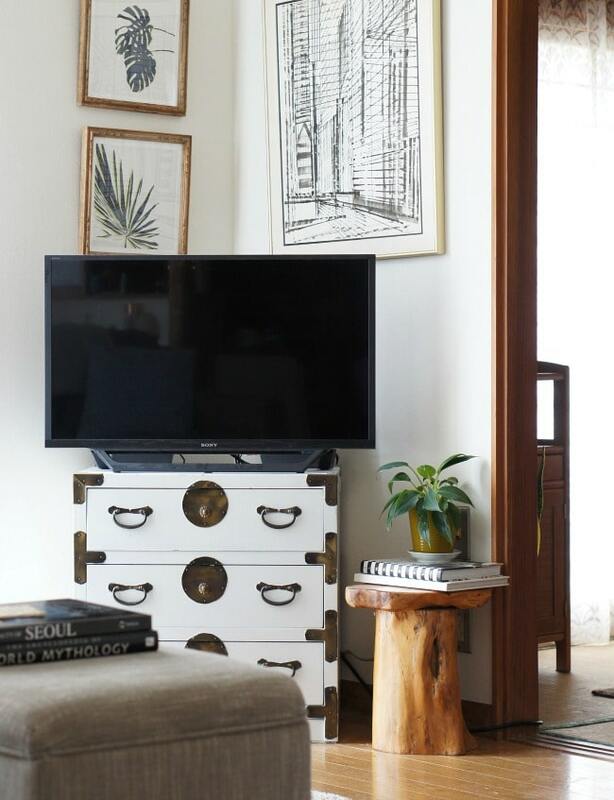 If you already have your media or tv stand set up in a room, add smaller furniture as accent pieces. Using a plant stand or garden seat as decor will cover those outlets and create more interest (it can also double as extra seating). I find that these little stools are invaluable as a renter! With many things in a rental, sometimes we just have to embrace them. But we can always try to draw the focus away from something unappealing. This wall unit’s placement makes it hard to hang window treatments properly and is in a really inconvenient spot. Outdated wall color or wallpaper. 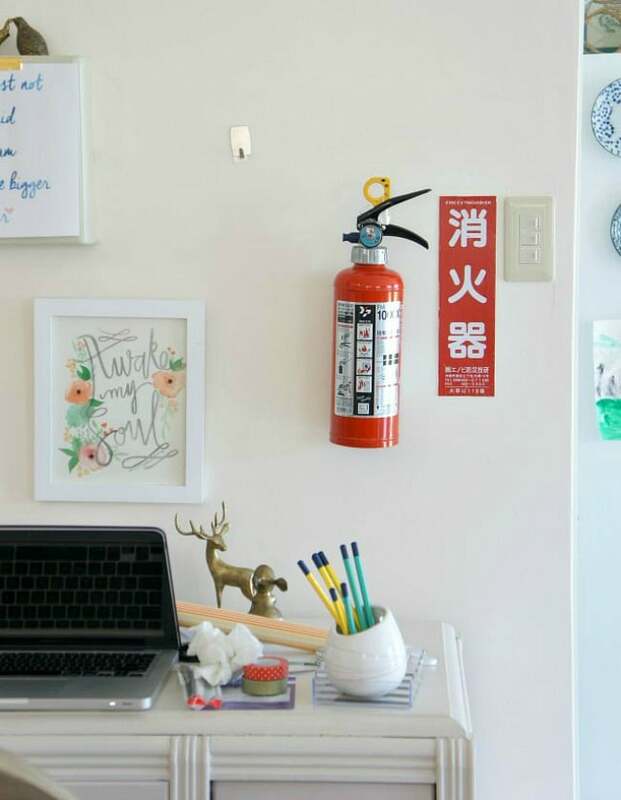 I’m just in love with all the renter friendly products available today like removable wallpaper, washi tape, and decals. You don’t have to settle for ugly walls! 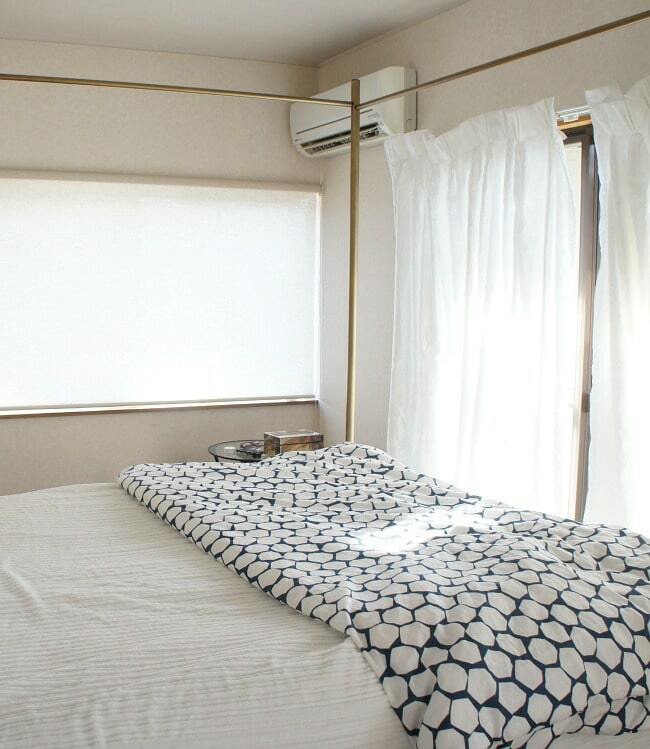 Even better, try something bold if you are a short term renter. It’s a temporary space so chances are you won’t get tired of it. 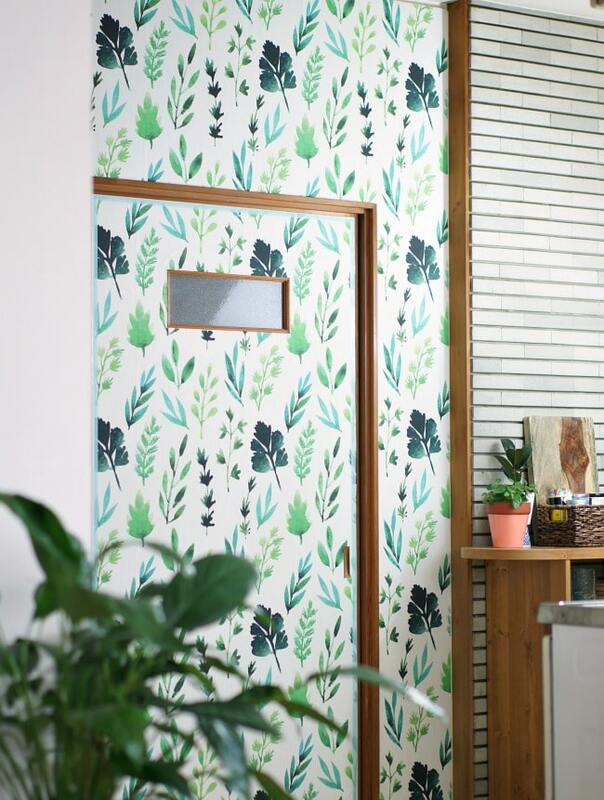 Removable wallpaper in a bright botanical print distracts from all of the “uglies” in this small rental kitchen. It’s actually charming now! Exposed wires and cords in the laundry room. This has been a problem in every place we’ve lived and I’m sure many of you have run into this too! 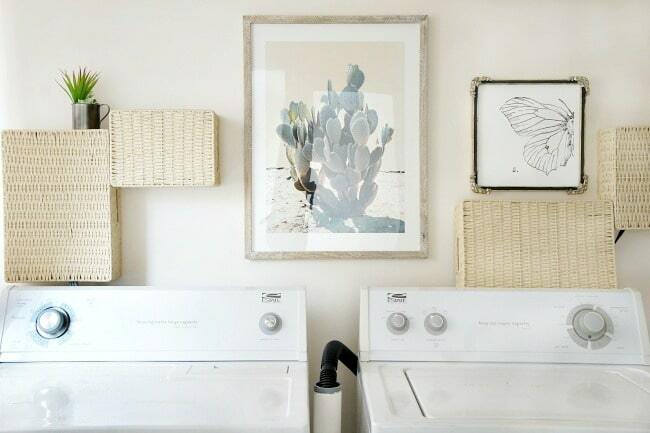 An easy solution for renters is to cover the wires and cords with baskets. 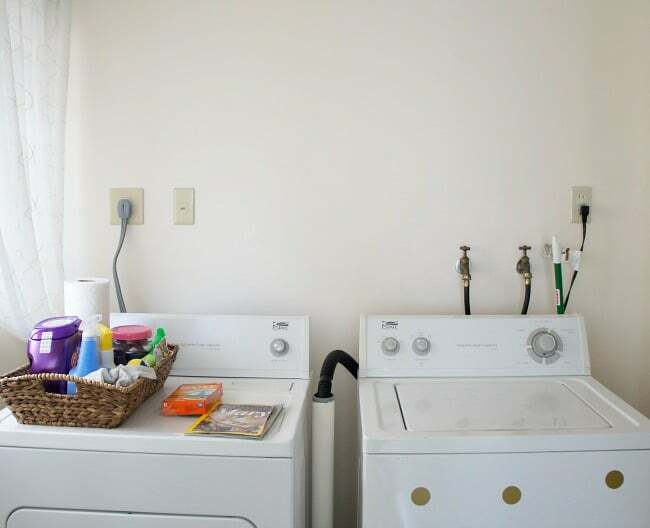 Thread the cords and hoses through the handles (or cut holes) and attach the baskets to the walls. You can also attach “L” brackets to the sides of the baskets and hang with command strips for a no hole solution. The baskets can also double as shelves! Protruding objects on the wall like fuse/electrical boxes and fire extinguishers. 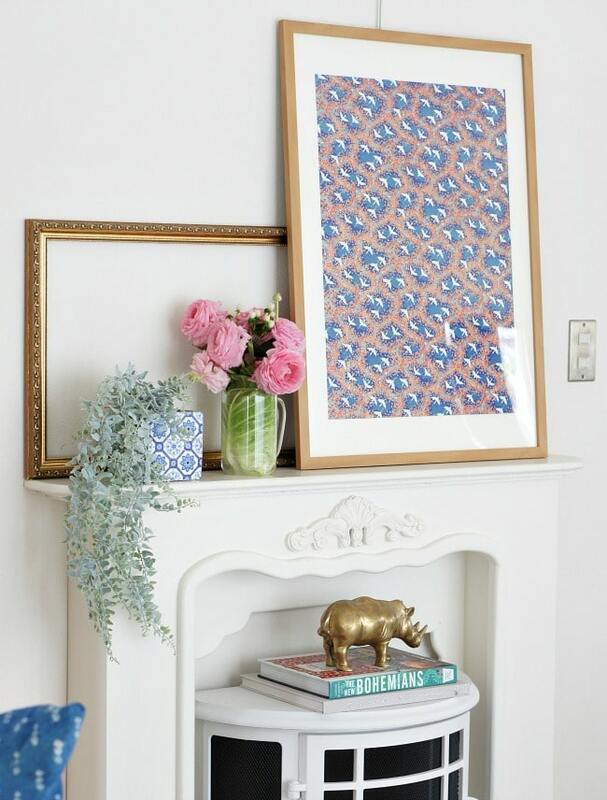 Don’t overlook the dollar store for cute trays and baskets to add to your rental gallery wall! Less than appealing cabinetry and/or pulls. 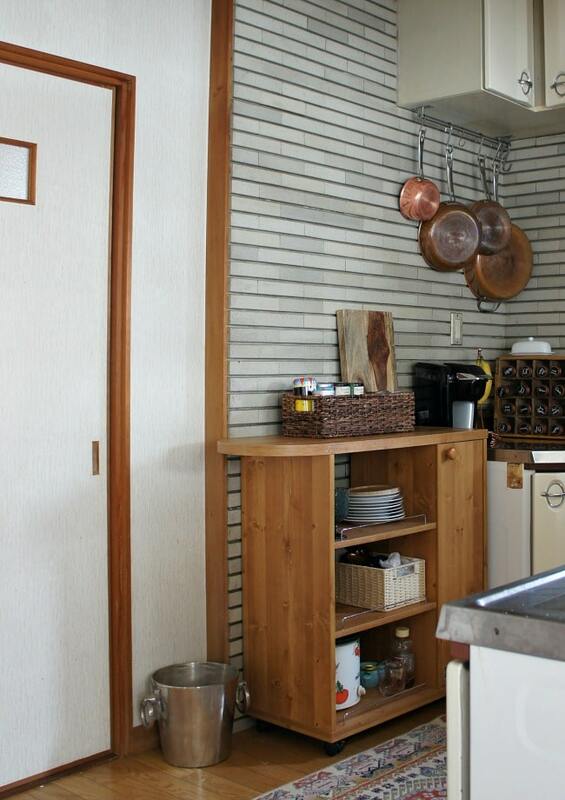 I’m sure we’ve all had to deal with ugly kitchen or bathroom cabinets. Sometimes a simple update to the pulls will do the trick. You can also try covering your cabinets with removable wallpaper, contact paper, or even create a pattern (faux molding) with decorative tape. Again, a perk of being a renter is getting to try something new and a little out of your comfort zone. 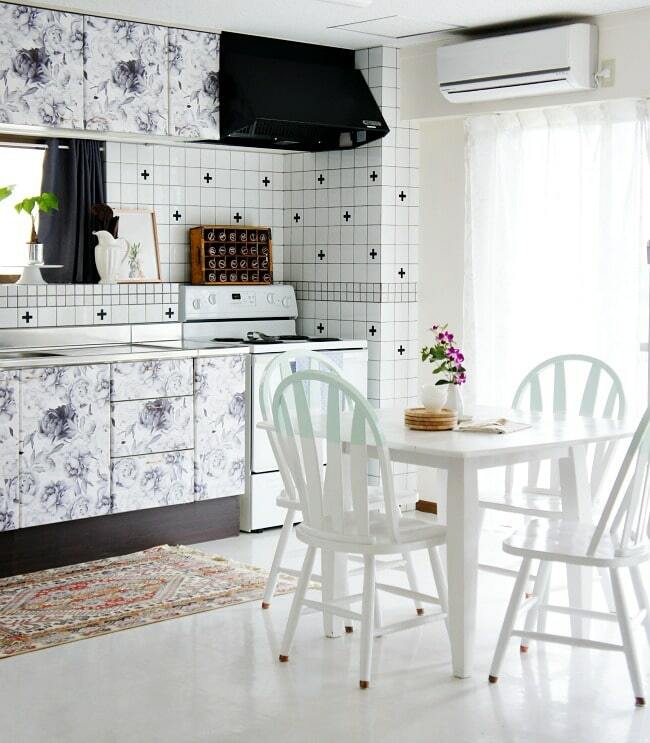 Don’t be afraid to have something unusual like floral kitchen cabinets! 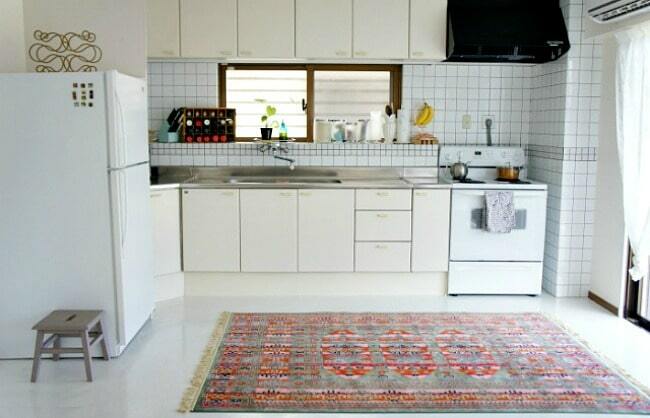 As you can see, with a little creativity and a few rental friendly decorating ideas, you can turn those eyesores into something ascetically pleasing. 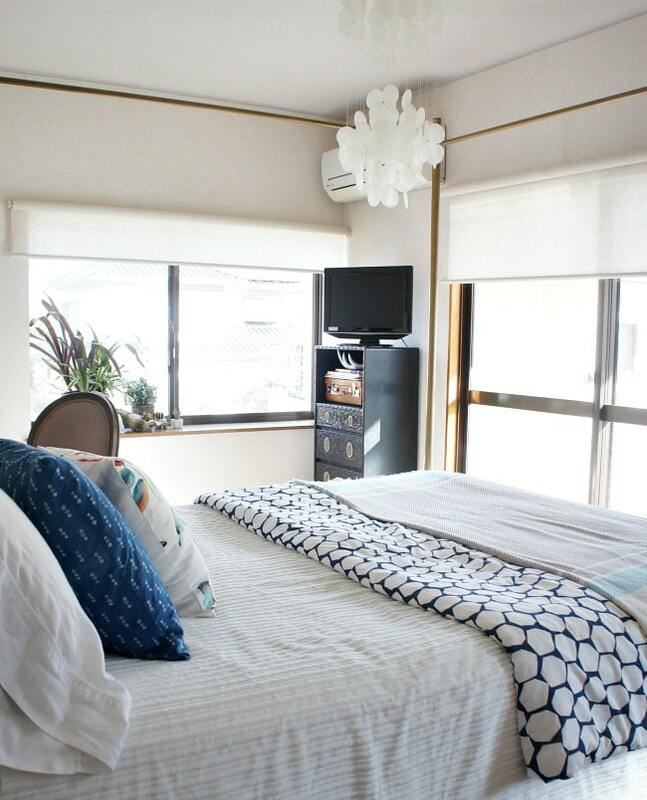 Don’t just settle in a rental, love your space!! Love this… What GREAT ideas!! Agreed – Kathy is brilliant! Wow, these are great! 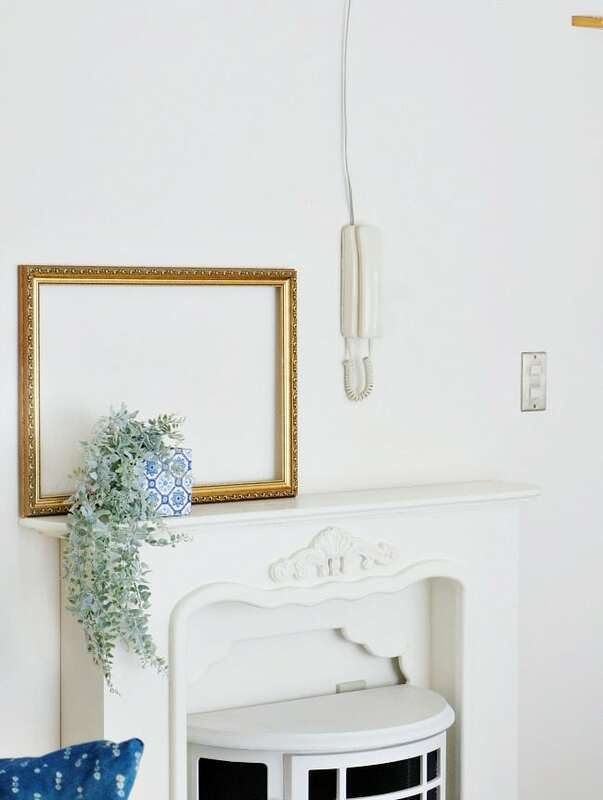 I think more than beautiful paint colors or amazing furniture, what we really need more of is real life solutions for these kinds of mundane decorating issues! Thank you so much for sharing these wonderful ideas. Also, Melissa, I really enjoy your blog! Thank you, Tina! I love sharing problem-solving posts like this too! While I love a fun room reveal, I know smaller projects and creative solutions are more practical for all of us. I am always impressed with your ability to tackle these spaces and totally transform them. You do have a vision that is stunning. These are great tips! Not only for military families but those with obstacles that can’t afford to change right away too! Nice job! ? ?